One of the exciting aspects of gradually opening drawers and exposing hidden corners in John Busby’s studio is finding stunning works like this. 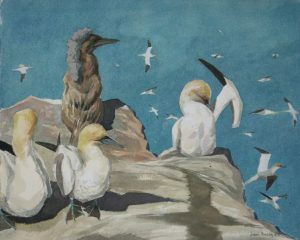 No, it’s not the famous Gannets on the Bass Rock, an oil that has been exhibited many times and appears in Land Marks and Sea Wings (p59) but a watercolour. The oil was one of John Busby’s favourite paintings (and definitely not for sale!) This watercolour was obviously painted with the original in sight, but 10 years after the date on the oil. It is also very slightly smaller and has a couple more birds in the background, but otherwise identical in composition and colouring. I don’t know why he decided to paint an alternative – particularly so long after the original had been finished. It is possible that it was a compositional ‘cartoon’ for the oil that was finished at the later date. Perhaps some of John’s artist friends may remember him talking about it. Do let us know.